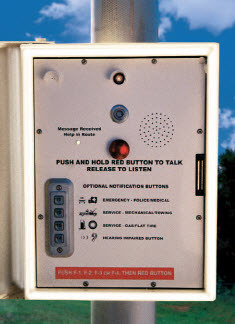 The MACplus Call Box features a four-button notification panel that can be tailored to user requirements – for example, medical/police, mechanical/towing, gas/tire and hearing impaired. It’s ideal for roadways, bridges, tunnels and commuter rail stations. The software-driven system sends automatic audible and digital signals to a dispatch center and is ADA compliant. Call Boxes alert the dispatch center every 24 hours with a status report. The powder-coated, stainless steel enclosure measures 15”H x 11 3/8”W x 7”D and features a self closing pneumatic/mechanical door with ADA-compliant hinges. It includes an activation inger, help-enroute LED light, set of small reflective decals and a 2 inch pole/wall mounting bracket. This unit requires the separate purchase of the software package listed below for programming the four call buttons.